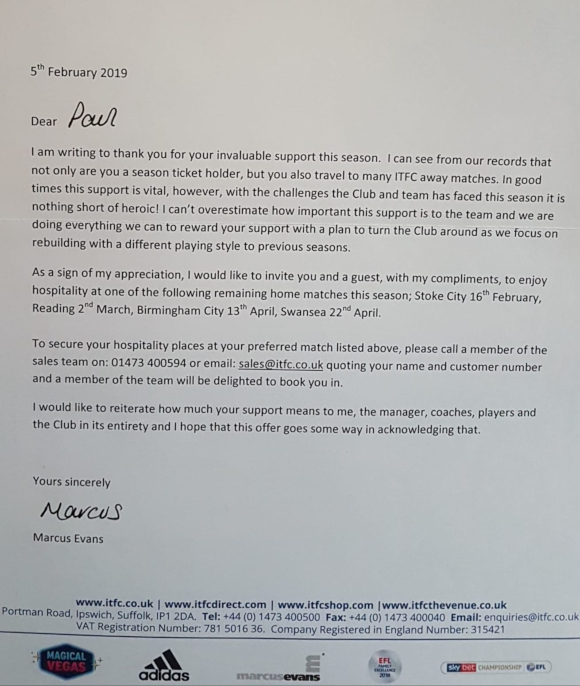 Blues owner Marcus Evans has written to regular home and away supporters offering them hospitality at one of Town’s remaining games at Portman Road this season. The letter, instigated by Evans himself, has gone out to a couple of hundred season ticket holders who have also attended more than half of the away matches so far this season. The fans have been invited, along with a friend, for hospitality usually costing three figures, which will include a pre-match meal in one of the suites and VIP seats at the Stoke, Reading, Birmingham or Swansea game. Was a lovely surprise this morning. Nice touch, following the manager's lead. He goes a good way towards killing the club then engages in his latest PR to make himself and others feel better about the sorry mess he has led us into. Still some will lap it up as if, thanks to him, we aren't about to go into the third tier for the first time since the fifties. Odious. Has Lambert bonked Evans on the head? as there seems to be a somewhat personality change. As someone who goes every away game I think it's a amazing gesture to give. People moan when his invisible yet when he does stuff like this people still moan. Bluearmy_81...this forum without your comments would be like Hamlet without the balcony scene. One other thing, Bluearmy...yes, I think most people on here recognise that it is largely because of Marcus Evans that we're going into the third tier, but without him, we might well not exist at all. You really are utterly blinkered in your hatred of a man you don't know based on his unwillingness to lose more than £5m a year on something that ultimately doesn't really matter. I don't hate him as a man, I hate what he has done to ITFC. If he couldn't afford to, or chooses not to I should say, fund Town appropriately, he shouldn't have got involved in the first place. Doesn't really matter?!! What a bizzare thing to say?! Too many apathetic town fans like you just don't seem that bothered. That's your opinion. It matters a lot to me. Shankly said "football isn't a matter of life and death, it's more important than that." Guess it mattered to him too. Pity you don't have more fight, passion and spirit in you for the Town. What is your threshold for being allowed to buy the club and take it out of administration then? What would be the minimum you'd expect someone to spend? It is a nice gesture, just think it is a little back handed though. I have gone for the Swansea game, but may retract it. I can't make my mind up as to whether it is a genuine gesture or just a hope that we renew next season. I suspect most of us understand it's not simply a case of the arithmetic of transfer fees which dictate how much it costs to run a club. Some people talk utter garbage. I'm not benefiting from this gesture from Evans, which, by the way, he doesn't have to do as it's a reward to fans who are clearly with the club through good and bad anyway. I think he's been a terrific owner, has invested SENSIBLY on the whole, saved us from goodness knows what, gives managers time, which is a rarity nowadays. His main mistakes have been some misinformed choices on the more footballing aspect e.g. letting PH dismantle the squad in the summer. Of course it isn't!! You don't buy a club if you can't or won't fund it properly though?!!!! Omg. I live in the north and fans of other clubs up here are as utterly mystified as me by your and other fans like you's apathy. They would be out with pitch forks. He chose well when he picked Ipswich Town!! No building a huge debt isn't a problem at all, that's what he's doing, building debt owed to him! It is the kind of thing that should reward the clubs most loyal fans. The question for me is why now and the answer is pretty obvious. Relegation looms and I think even Evans has finally realised he’s got to put some effort into holding onto the fan base we have left. It’s good PR but it would have been more effective had it been done before we got into the mess we are in currently. It’s simple. He does/says nothing. He loses thousands of loyal fans after this sorry season. This is his way to keep as many as poss on side. Of course he’s dealing with very gullible fans. You only have to read the 1st comment above to see that. “No problem, you’ve tight-fisted my club towards oblivion, but....your giving me a freebie, that’s ok then. #in Marcus we go down and down. I’m a town fan of 40 plus years home and away. And I’m very much with Bluearmy 81. Again, more abuse on here, particularly you Jonny. What gives you the right to take that attitude, grow up. Blue army has strong views about the owner, as do I, there's a bigger picture here that a free steak and chips won't disguise. The owner is fully responsible for our situation, he bought the club for reasons of either vanity or economics or both - do you think he's a philanthropist ? He's a multi millionaire businessman who doesn't turn up and remains silent more than is normal for an owner. He has mismanaged the running of the club and that's had an impact on the football. Unless you haven't noticed we are bottom of the league, staring relegation in the face and looking forward to the third tier of football in the most embarrassing episode in this club's great history. And there are still people who think he is the saviour. Look at our ground, it's a disgrace and it typifies the decay that exists at the club. Carberry. Very well put. And agreed by 98% of town support. In my opinion. Cheers since73. Good to see some Town fans have some common sense and can recognise the elephant in the room! If it wasn't for the likes of you, Carberry, Wiksey etc I'd feel like I was going mad! !